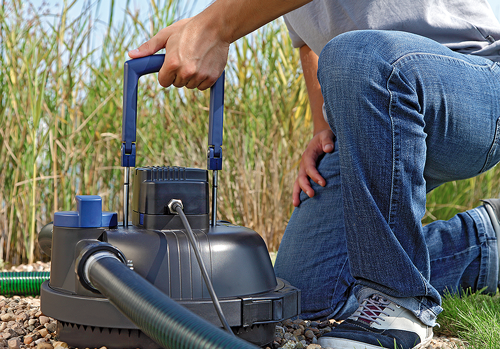 OASE Filtoclear Pressurised Filters and Filter Sets with built-in UV Clarifier for ponds up to 30,000 litres. Sets include AquaMax ECO Premium Pump. The OASE FiltoClear is the market-leading pressurised pond filter with integral ultraviolet clarifier for effective mechanical & biological filtration of ornamental, goldfish or Koi ponds. These pressurised filtration systems can be used to lift the cleaned water to a raised watercourse and feature patented Easy-Clean technology. The FiltoClear can be supplied as a Filter/UVC only or as a combined set complete with the cutting-edge OASE Aquamax Eco Premium pump. Inside of the FiltoClear chamber are a series of specially developed filter foams which will extract pond debris and fish waste whilst the integrated Ultraviolet Clarifier kills and clumps single-celled algae which is also trapped and contained inside the filter sponges. The filter foams create a huge filtration surface area which means less frequent cleaning. The pressurised container is fully sealed so the processed water can be passed up to 2 metres above the pond surface level if desired, making this ideal for streams and cascades. On the top lid of the FiltoClear is the innovative cleaning valve and pull handle. The valve allows the water to be diverted to a 3rd ‘waste’ outlet and the handle can then be pulled which will compress the filter foams and release the debris and fish waste, which can then be passed to planting borders or soakaway. The filter body can be buried up to its collar allowing the system to be easily disguised from view. The FiltoClear Sets offer superb value and include the market-leading AquaMax Eco solids handling pumps for superb cleaning performance. 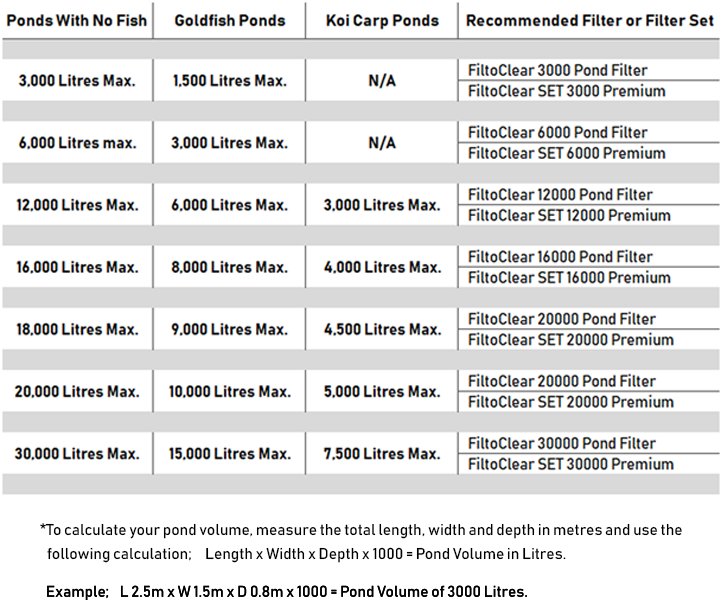 Choosing the most suitable FiltoClear for your pond.